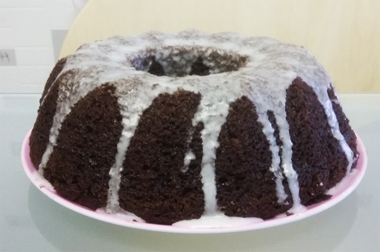 Vegan chocolate and almond bundt cake. A tasty take on the bundt cake that's dairy and egg free to boot, making for one deliciously moist and squishy vegan bake. Using basic ingredients that you'll already have to hand, making for an incredibly easy and tasty bake that you can make anytime. Ingredients (for an 8 cup bundt tin). Pre heat the oven to 180/160c fan/gas mark 4 and thoroughly grease your bundt tin. Combine the dry ingredients – self raising flour, baking powder, cocoa powder and salt in a large bowl and mix well to ensure it's all mixed together, set aside. In a separate bowl cream together the margarine and caster sugar till pale and fluffy. Stir in the vanilla and mix, this will form together as a clump as this stage, then pour in the almond milk a bit at a time and mix to combine, I used Almond dream for this cake which you'll find in most supermarkets. Make a well in the centre of the bowl with the dry ingredients and pour the milk mixture into this. 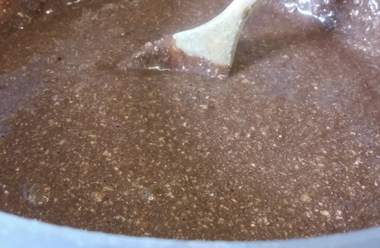 Stir well to combine and mix, what you should have is a runny mixture at this stage (see pic), that's still thick when you run a spoon through it, but mostly runny. Don't worry if any bits of the margarine float on the surface of the mixture, as this will melt down perfectly whilst the cake is baking. Not using a replacement for the eggs that you'd normally use in a traditional bake may seem a little alarming at first if you've not baked a vegan cake before, especially when you see your mixture prior to baking, but don't panic, using self raising flour instead of plain flour with added baking powder will really help with that rise, ensuring a tasty bundt cake once baked. 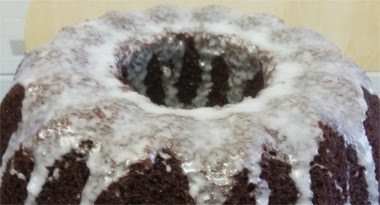 Pour the mixture into the bundt tin, ensuring that it's level, then bake for 30-40 minutes till risen. In my fan oven this took 30 minutes, so keep a close eye on the cake past the 20-25 minute mark. Leave the cake to cool in the tin for 15 minutes, then run a rubber spatula around the cake to loosen in from the tin. Place a wire rack on top of the tin opening, then turn it upside down to release the cake, it should fall out of the tin straight onto the rack. Leave your cake to cool then mix a water icing to drizzle over the cake to finish. 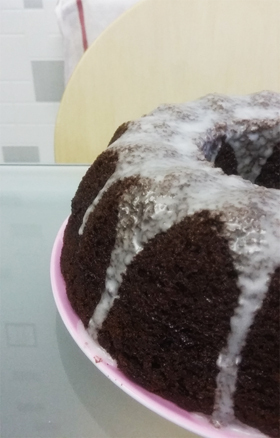 Compared to your usual bundt cake this will be much moister with the addition of the almond milk to the bake, but what you should have is a lovely moist and squishy cake with a delicious chocolately almond flavour. It should last for 3-4 days when kept in an airtight container. Tea room exploration: Proper Tea. A quaint take on the traditional British tearoom, where you can over indulge on a spot of tea whilst you feast your eyes on some rather scrumptious bakes. Tucked away in one of Manchester's tranquil hidden spots, you'll definitely want to unwind and treat yourself at Proper Tea! Just a stones throw away from one of Manchester's busiest shopping districts you wouldn't expect to find a traditional tea room tucked away here, but a short walk past the restaurants at the Corn Exchange and a hand full of old fashioned pubs, you'll find a lovely spot for a cup of tea and cake. 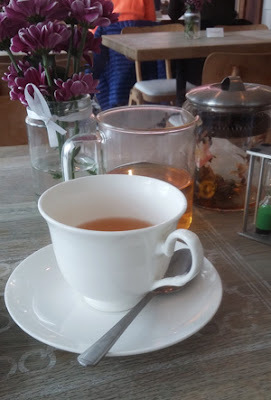 Proper Tea have been serving up their decadent selection of loose leaf brews for the past few years in a lovely secluded spot opposite Manchester Cathedral. A more modern take on your traditional British tea room, here they certainly love their tea just as much as they adore their freshly baked cakes. With a staggering selection of brews available where better to stop off for a spot of tea! They're already made quite a name for themselves for their range of loose leaf teas, but this quaint tea room has also been helped along by broadcaster Yvette Fielding who co-owns the tea rooms, thankfully you won't spot any ghost hunting going on here though, just delightful brews and tasty treats! 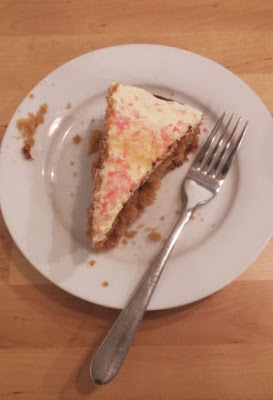 Their unique twist on the traditional tea room has made them a favourite to visit, especially if like me you adore your tea just as much as scrumptious cake! 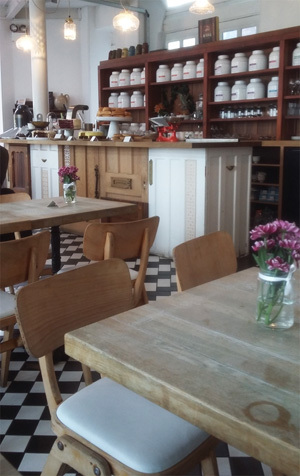 With a quirky feel to the venue inside, you'll find old wooden doors turned into décor and counters around the tea room, with a lovely light and airy feel. But of course, it's all about the tea and cake for me, one of the first things that you'll notice as you enter the tea rooms is their counter brimming with the days latest bakes in front of their vast selection of tea caddy's, those white pots you'll see behind the counter are all full of tea that's just how much you'll find to choose from! With a vast tea menu available, ranging from classic black tea blends, to green teas and fruity infusions, whatever takes your fancy you'll be bound to find at least two or three variations of it on the menu. The bakes are just as outstanding as the brews, with a daily selection of freshly baked treats varying from dainty brownies to red velvet and lemon cakes, with gluten free bakes available too. On my visit their was quite a selection to choose from, ranging from rich flourless chocolate cake, to white chocolate and poppy seed cake, and even brownie tarts! I went for a slice of their fruity looking coconut and carrot cake, a lovely moist bake packed with fruit and walnuts, topped off with a sweet frosting and coconut shavings. A lovely sweet bake, and a generous portion to boot! To accompany my bake I chose a pot of their Rosy Grey tea, a lovely rose scented take on the classic earl grey, apparently one of Yvette Fielding's favourites so I've chosen well! My tea came with a lovely set of timers to ensure the perfect brew, opting for light to strong for your tea. Certainly a good choice with my cake, the two went together perfectly. A lovely tranquil stop off to take in a spot of tea, somewhere I'd actually had on my 'to visit' list for some time, so glad that I decided to pop in for a treat. 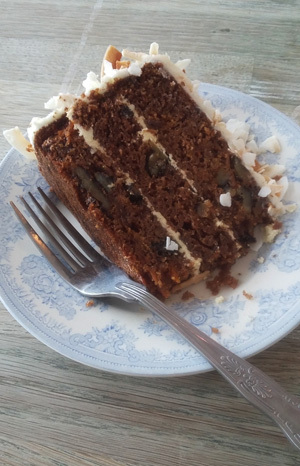 If you love your tea just as much as your cake you'll definitely want to pop in! 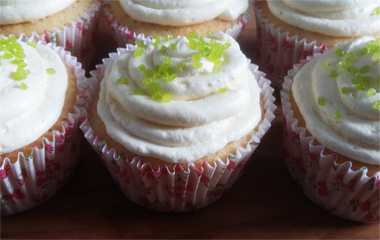 Taking the classic bake and turning it into a scrumptious cupcake, this lovely recipe makes for a delightfully sweet bake that's refreshing and light with all the flavours of a key lime pie baked into a cupcake! Cream together the butter and sugar till pale and fluffy, then add in the eggs one at a time and beat, followed by the vanilla essence and mix. Sift in the flour then mix, scraping the sides and base of the bowl to ensure it's fully mixed in. Then spoon the tasty mixture into each case, filling around 2/3 full, and bake for 20-25 minutes till risen and golden. Set aside to cool, then mix your frosting. 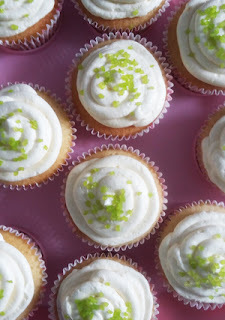 Mix together the butter with half of the icing sugar, I used Sugar and Crumbs Key lime flavoured icing sugar for this bake, it's lovely light flavour is just perfect for these cupcakes, but should you prefer you can add 2 tsp's of lime juice to 1 tsp of vanilla to icing sugar to create the flavour. Mix till well combined. 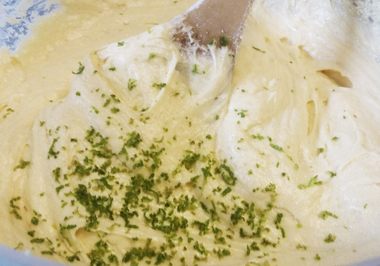 Sift in the remaining icing sugar and mix till fully combined, whisk for an extra minute for a lovely creamy frosting. Spoon the mixture into a piping bag with a plain round piping nozzle, this will allow you to create the lovely swirl of frosting on top of each cupcake. Pipe a swirl all around the top of each cupcake to cover, then pipe a second swirl in the centre of each cupcake to layer the frosting up. 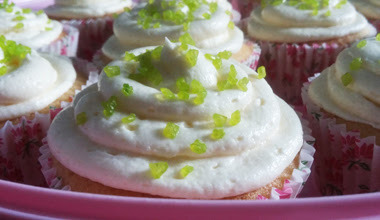 Finish off with a sprinkling of lime neon sugar, I used Dr Oetker's Neon sugar which you can find in most supermarkets, this adds a lovely pop of lime colour to the cupcake and adds a tasty bit of crunch too! The result is a lovely sweet, refreshing bake that's perfect for a summer's day. These will keep well for several days in an airtight container, that is if you don't eat them all quickly! Cake shop exploration: East Avenue Bakehouse. You don't need to walk far in Liverpool to stumble upon a cosy place for a quick bite to eat, but why eat just anywhere when you could over indulge in some freshly baked goods and tasty locally sourced produce. East Avenue Bakehouse does just that, serving up some of the tastiest freshly baked goods you'll find on Liverpool's bustling Bold Street. This isn't just any local bakery, East Avenue Bakehouse certainly adores it's baked goods and they've been serving up a tasty selection of the sweet, doughy stuff for the past couple of years from their lovely Bold Street cafe. They've certainly made a name for themselves amongst the locals as the place to visit for freshly baked, locally sourced treats, with a delicious seasonal menu that's constantly changing, you can be sure of something different to over indulge on every time you visit. 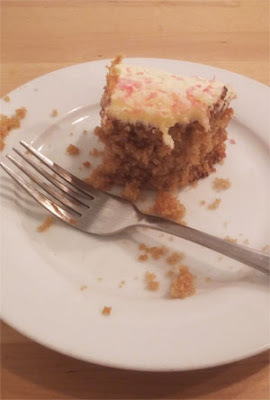 Located at the top end of Bold Street, as good an excuse as any to stop off and over indulge after that walk, their large glass fronted cafe certainly draws you in as you can coo over the latest bakes from the shop window. Handily placed at the front of the shop, the first thing that greets you is a counter of the days latest bakes, you'll be hard pushed for choice as you find yourself faced between several different cakes and sweet treats to choose from, varying from tasty brownies to scrumptious cakes and yummy pastries. A different selection everyday so you really will be spoilt for choice! They certainly do love their baked goods, as their daily selection of scrumptious treats shows, on my visit their was a tasty selection of treats to choose from, ranging from chocolate brownies to cheesecake slices and even doughnuts (oh my!!). 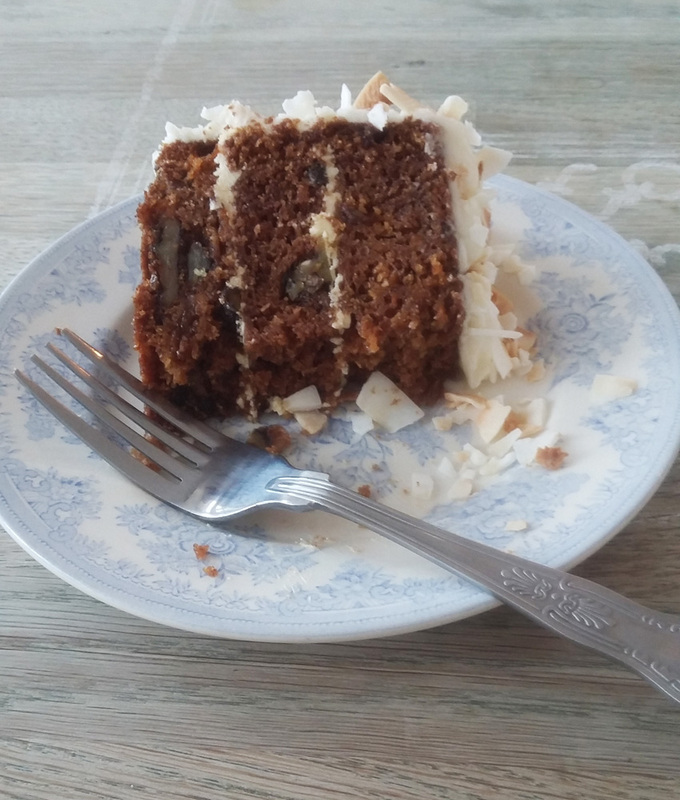 I went for a slice of their Hummingbird cake, a lovely sweet bake topped with coconut flavoured buttercream, lightly flavoured but delightfully sweet, the coconut topping went perfectly with the bake. To accompany my cake I had a pot of their Earl grey tea, which went perfectly with the bake, you'll find a full menu of teas and coffees, as well as a spot of tipple if you prefer a boozier cake trip! A lovely find, their light and airy cafe certainly does draw you in, especially when you can view the bakes from the shop front. 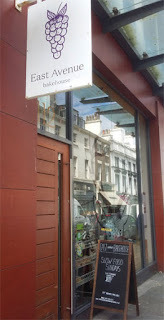 Definitely worth a visit for their ever changing menu of baked treats and a great stop off at the top of Bold Street.